Adulthood can be a humbling and sometimes scary experience, but that doesn’t mean you can’t have some fun while managing your responsibilities. Our luxury apartments at Alexan Arapahoe Square are perfect for balancing out work with play in your daily schedule, whether you’re a single resident looking for Denver studio apartments or one-bedroom home or you’re planning to room with friends and family in our two-bedroom models. There’s a fit in our wide range of floor plans for anyone’s needs. 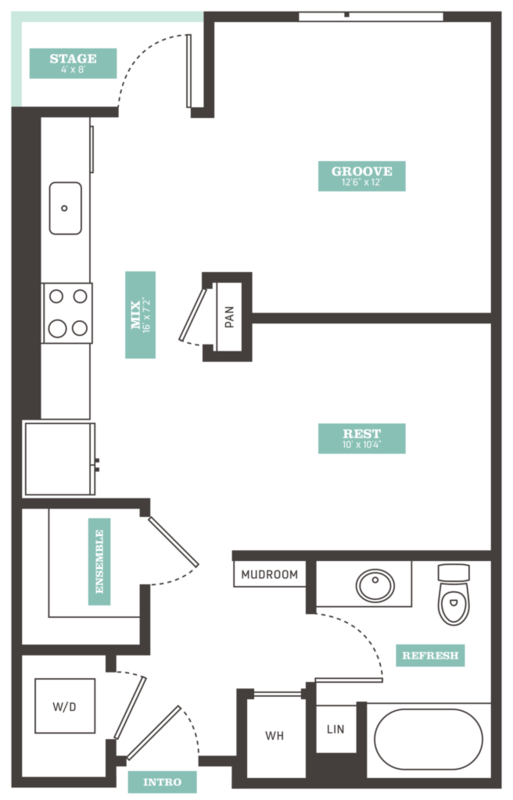 One of our many luxury studio floor plans, the S6, is also our largest, standing with approximately 614 square feet of living space for any resident to stretch out in. The entry corridor has a handy mudroom installed to arrange your umbrellas or winter coats, while the standing washer and dryer connection lets you work on laundry right from the comfort of home. Grab a much-needed good night’s sleep in the bedroom nook, partitioned off by a solid wall for added privacy and next door to an expansive walk-in closet for easy outfit organization. Wash away your worries in the deluxe bathroom, complete with a large soaking tub. Try out new recipes or settle for a classic snack in the contemporary kitchen, featuring ample pantry and cabinet space for all your groceries and cookware. Finally, turn your living room into the ultimate lounge space: settle down on your couch and binge your favorite shows, invite friends over for game night, or even enjoy a few drinks out on the private balcony. Make the most of your age and independence here at Alexan Arapahoe Square. Take a closer look at our fabulous luxury Denver studio apartments, including the S6, this weekend.